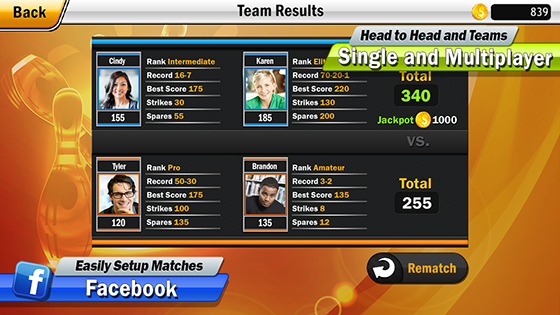 Bowl With Me – Game For Bowling Lovers ! 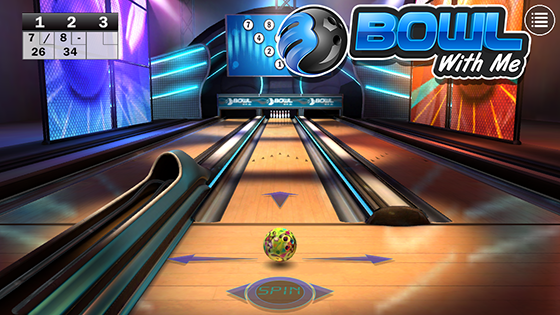 Bowl with Me is a free to play bowling game that works on the Apple iPhone, iPod Touch and iPad. Bowling has always been a favorite game of mine but there is no multiplayer bowling game out there in the market. Megu, the publisher and game developer of Bowl with Me has created a bowling game that you can have fun with playing with your friends and family which you can play head to head or 2-on-2 team games. As the game is free, it will always display the video advertisements before you get to start your game. This can be annoying as there is no way to turn off the videos while they are playing. You can only close the videos after they are being played. Bowl with me gameplay is pretty much straightforward in the bowling alley. There are two directional controls to adjust whether you want your bowling ball to move to the right or left. You can also adjust the speed at which you can spin the ball while it is moving towards the bowling pins. 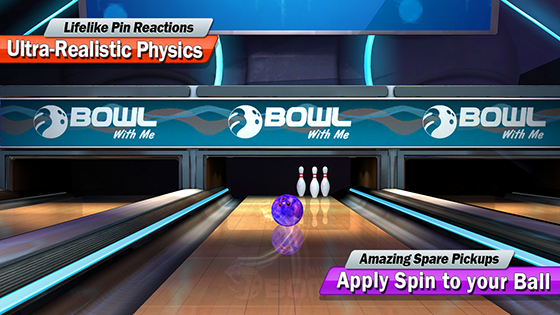 The spinning rate is the force that will usually strike the pins with full force at the end of the game. However, there are usually caveats of doing the spins on the bowling ball. Usually, you got to time the moment of the spins together with the time you throw out the bowling ball. If you do the motion too fast, the ball might end in the drain and not hitting the pins at all. In my opinion, I have been trying out bowling without any spins. I just need to time the moment and direction where the bowling ball hits the pins. This method of gameplay has hits and misses. Sometimes, I am greeted with strikes with audience cheering or sometimes the pins are removed when I miss hitting the pins.The scores of the game are clearly shown on the top left corner of the screen just like the normal bowling game you play outside in the bowling alley. You can also buy different bowling balls using the coins you gained throughout your game. The bowling shop allows you to purchase a deluxe version which will remove the annoying video advertisements and you can earn 2x coins in practice mode. You can also purchase gold coins with real cash in the shop if you are tired of playing the game to gain coins. However, you can discuss tactics of bowling with your friends over coffee before dropping the ball on this game instead of buying a ticket to the bowling alley. The career statistics enable you to see your game progress and ranking. You can certainly share your high scores on Facebook and Twitter to boast how good you are to your friends. For a price that is free and you can play the game with your best friends, this game is certainly the bowling game you wished you had on your iOS devices minus the annoying video advertisements.